The recipe for any Mongolian Grill is simple: hit up the buffet-style tables and pack whatever you want into the bowl, be it vegetables or meats or seasoning sauces or any combination thereof, then watch as the cook fries it up on a huge iron griddle and brings it back to the table. Indulge, enjoy, and repeat. The devil is in the details, however. And I’m happy to say that Mongolian Grill in Columbia gets the details right; the place has been open some 14 years, so I suppose that others would agree with me. While some places skimp on the assortment of to-be-fried foods, they’ve got pineapple on the line as well as whole eggs, plus a solid assortment of bok choy and sprouts. Rice and noodles are also out there too, compared to some places that only serve white rice on the side. My first bowl was chock full of veggies and chicken, plus a hearty helping of pineapple. The sauces were a mystery to me, so I didn’t attempt to follow the directions. I just threw a little bit of everything in there, with emphasis on the ginger and hot oils. I figured worst case I’d just go back and try again. The result was rather tasty, however, with the chicken tender and bits of egg perfectly soft but not seared, vegetables still slightly crisp but hot on the tongue. I then went with the tofu and beef, with more emphasis on sprouts and greenery. I found the beef to be a little touch, but still quite flavorful. 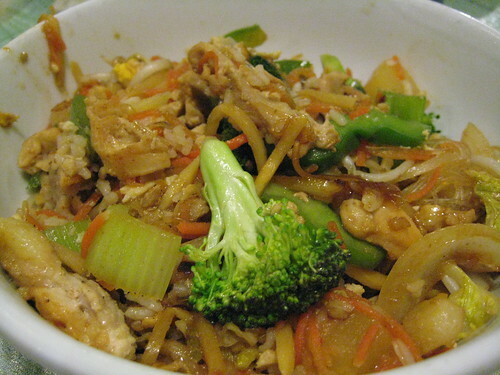 Vegetables were fantastic again, combined with the lo mein noodles made for a filling second bowl. It’s an all-you-can-eat affair, so stretch your stomach out and go hungry. Personally, I doubt I could manage more than two full bowls, but then there’s nothing to prevent you from doing a half-dozen smaller bowls. 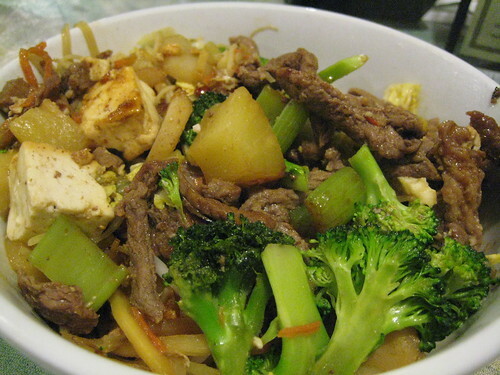 There’s a Mongolian barbecue place in Williamsburg, VA that has been around for at least 10 years; if you’re ever down there, you should check it out! Great food. The service is a bit different, though — you bring your bowl to the griddle, then you stand there and watch it be cooked, then the chef hands you your bowl and you carry it back to your table.